Notion Update v.6.2 Available NOW! Release Date–Tuesday, May 23, 2017. Now merge audio and note data into existing Studio One and Notion documents, not just create new ones. 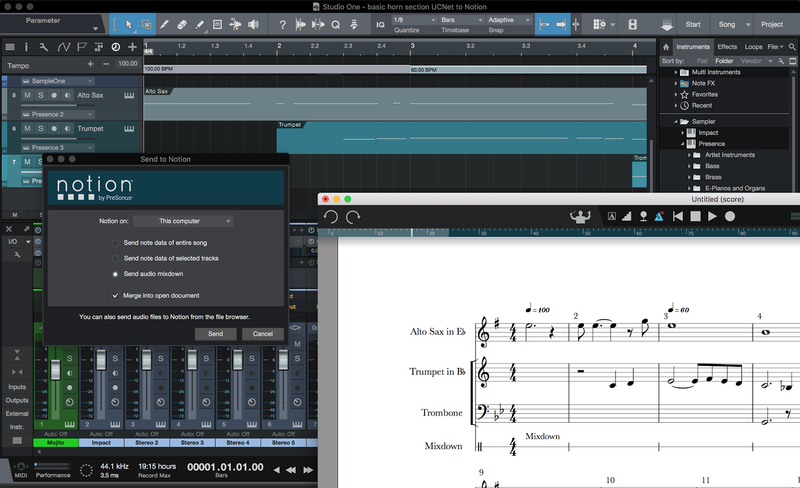 Got a Studio One project and want to edit in notation? Now you can send notes to Notion, make some changes, and then send back the notes, updating the original Studio One document. You can even also send a mixdown to Notion, as well as the note data – and if it changes in Studio One, then just send the mixdown to Notion again. Sending stems from Notion to Studio One, and need to make some changes in the original? Keep your Studio One mix and effects exactly as is, and just update the stems from Notion. Tempo track now sends when transferring between Notion and Studio One. Send all tempi and time signatures, whether you’re sending audio or note data. Clean up a performance in Studio One, maybe using Melodyne’s tempo detection, then send to Notion for the notation. Notion will show all tempi – and if there are many changes, will show them as ‘abbreviated’ tempo (which can then be hidden). Slur Control – now when a slur is selected, you can drag its control points to adjust the start and end points, its placement, and even the curve itself. New Brass Band (UK style) template. Step Time pencil icon added to Drumpad. Enter key now repeats previously entered chord in step time, when using drumpad and keyboard (as per fretboard). When handwriting where part contains existing tab notes, for any notes that are not changing, preserve the existing tab strings. When handwriting into a part that is linked to tablature, us the same tab logic as for standard note entry. Fix for when handwriting into a measure that already has an existing dotted chord, the dotted chord would become double-dotted. Fix for when adding a note with handwriting to a measure that contained a chord with multiple ledger lines, the chord would change. Fix for handwriting over more than one measure at a time in the handwriting window. Fix for when handwriting over more than one system. 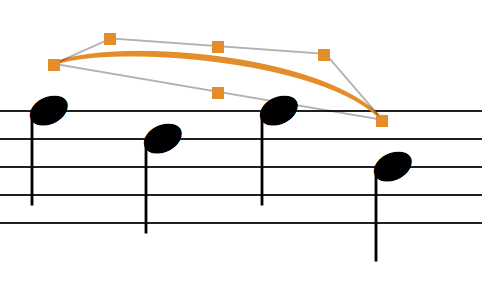 Gliss/port/slides: now go in the correct direction between two close notes; start on the correct side of the note; now do not collide with augmentation dots or accidentals; now centre on notehead rather than attachments. Sibelius/Finale keypad articulations and ties now work in Step Entry. Tie in Step Entry now works when International Shortcuts are selected. Edit Velocity keyboard shortcuts now work again, providing Sequencer overlay is selected or if the staff is a sequencer staff. Give somebody to download for MacOS! I can not update the program!